Beautiful in springtime when displaying the double-form pink flowers, the Kwanzan flowering cherry tree (Prunus serrulata "Sekiyama" or "Kanzan") may suffer from many fungal leaf diseases. Although rarely dangerous to the health of the tree, particularly wet or humid growing seasons can increase issues with the fungi. Unfortunately, ornamental cherry trees face many diseases overall that can lead to a shortened life span. A Kwanzan cherry tree grows 20 to 25 feet tall and equally wide in U.S. Department of Agriculture hardiness zones 6 through 8. All cherry trees including the Kwanzan variety are susceptible to many fungus species that cause spotting and small rotted holes in leaves. Cool or wet weather, high humidity and growing in shady conditions often increase issues with these fungi. The spotting becomes increasingly visible at the end summer and peaks in early autumn. 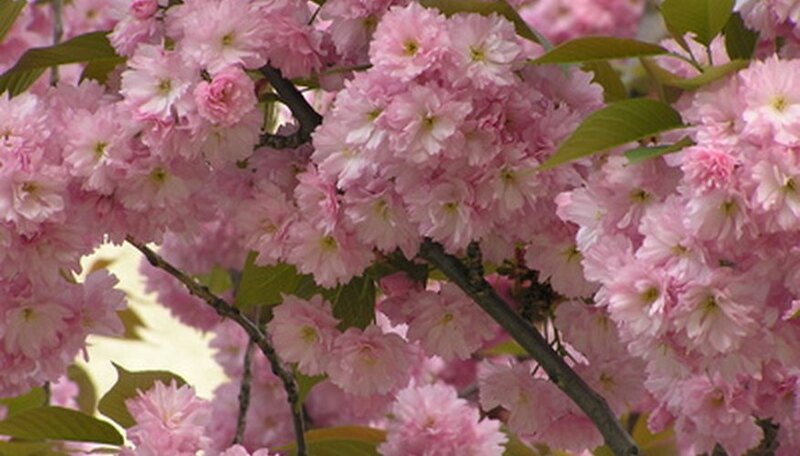 While the spotting often doesn't harm Kwanzan cherry trees, if the fungus begins harm on leaves early in the growing season the leaves may drop off in summer, depleting the tree of food-making abilities. The species of fungus that cause various leaf spots in cherry trees are numerous: Alternaria, Cercospora, Coccomyces/Blumeriella, Coryneum, Cristulariella, Elsinoe/Sphaceloma, Mycosphaerella, Phyllosticta and Taphrina, according to the University of Illinois Cooperative Extension. Powdery mildew is a secondary disease or fungal condition usually caused by the secretions of honeydew leaf by insects such as aphids or scale. Warm temperatures and high humidity allows the white powdery fungus to take hold on the upper surfaces of leaves. Extreme coating of powdery mildew reduces light absorption by leaves, reducing food made and can weaken the tree. Verticillium dahliae, a species of soil-borne fungus, often invades an open wound in the trunk or branches of the Kwanzan cherry tree. Once inside and spreading across the tree via the vascular tissue, leaves will curl, wilt, prematurely yellow and fall off as twigs are choked of water and the fungus releases toxins. Dagger nematodes carry the rasp leaf virus to trees, and infect lowest limbs and leaves first. Spreading slowly across the Kwanzan cherry tree, the leaves look pebbled on their upper surfaces but their undersides show the characteristic narrow projections called enations that look like warty hairs. These infested leaves also are deformed, narrow and often folded according to Oregon State University. Another plant virus, necrotic ring spot, spreads among cherry trees by grafting techniques by horticulturists and naturally between trees from infected pollen. This virus has many strains, according to Oregon State University, causing diseases known as tatter leaf peach ringspot, recurrent ringspot, cherry rugose mosaic, rose mosaic and almond calico. Because the virus is received by the female parts of flowers, trees do not become susceptible to necrotic ring spot until they are old enough to bloom. Lots of tan to yellow ring spots and eventual networks of holes on the leaves suggest this viral disease is present in Kwanzan flowering cherry trees.